A topic of some speculation heading into this spring was the health of Buster Posey and who would be his backup(s) if he showed he might not be in game shape or would need more time to recover from his hip surgery than was expected. Today, with Stephen Vogt – who is recovering from shoulder surgery on his shoulder capsule and “clean ups” on his rotator cuff and labrum, according to MLB.com – signed to a minor league deal and still recovering from his shoulder injury, and Joey Bart set to start his season in San Jose, the Giants released Rene Rivera, one of the two active backup options behind Posey. Rivera went 8-for-31 (.258) in 11 games this spring, and was a favorite among Giants pitchers, according to Andrew Baggarly. Giants have released C Rene Rivera. He had a good spring. Doubt this is the decision if the Giants were less confident about Posey’s health. 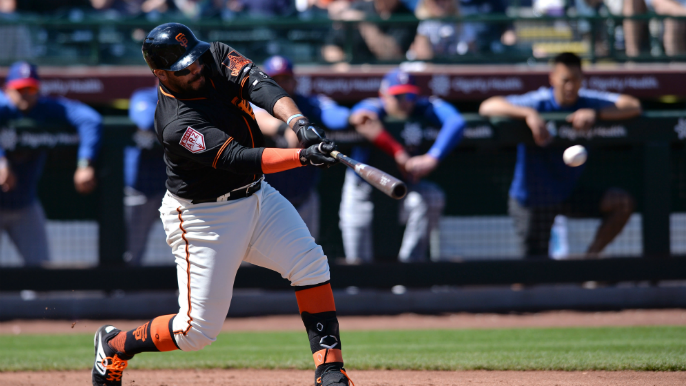 This means that Aramis Garcia, 26 – who had a fantastic 19 games to end to last season, during which he went 18-for-63 (.286) with 4 home runs and 9 RBIs – has essentially locked down his spot as Posey’s backup. Garcia is 7-for-30 (.233) with 2 home runs and 4 RBIs in 18 games this spring, while Posey has played in 11 games is 7-for-29 (.241) with 3 RBIs and an odd triple. Nick Vincent made the club. Parra and Solarte also told they will be on the team.